Discovering the best beard trimmer that offers a clean cut without any split hairs or irritation is rarely easy. Since there are a variety of beard trimmers from which to choose, the process of selecting the right device for your unique facial hair needs may be extremely overwhelming. Some factors to consider when purchasing a beard trimmer include price, durability, features, size, weight, and many other considerations. Here is a list of the three top beard trimmers as well as a budget-friendly facial hair shaver. Recognized as one of the top beard trimmers on the market, the Philips Norelco Beard Trimmer Series 7200 is sure to offer a clean trimming experience. Available in silver, a perfectly even trim with the minimal mess is easily achievable with this product. Designed with a variety of premium beard trimming technology, you will not need to repeatedly trim the same area multiple times to obtain an attractive shave. 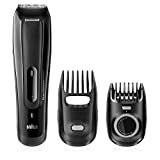 As a result, you can feel confident that the Philips Norelco Beard Trimmer Series 7200 will always deliver your desired facial hair trimming results. The product’s revolutionary vacuum system enables you to shave your facial hair with virtually no mess. The integrated vacuum technology can successfully catch about 90 percent of cut hair with the use of a powerful motor and fan system. Therefore, you won’t have to worry about hair flying all over your bathroom sink. Another unique feature of the product is its innovative lift and trim technology that can effectively lift and guide hairs for a clean cut. Similarly, attached to the device is a skin-friendly rounded contour comb that can also provide an even trim. Equipped with 20 precision length settings, the device offers you the opportunity to choose your preferred trim length by easily adjusting the zoom wheel. The length settings range from 0.5mm to 10mm with a 0.5mm precision. Simply click on the precision trimming to produce clean edges and fine details on any area of your face. The self-sharpening steel blades are double sharpened to promote fast and safe trimming by cutting many hairs with every pass. Because of these innovative blades, you are unlikely to experience unpleasant problems such as skin irritation or split/in-grown hairs while using the product. 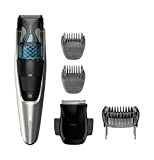 The Philips Norelco Beard Trimmer Series 7200 can accommodate corded and cordless operation. The advanced lithium-ion battery offers you superb power, so you can always expect exceptional performance when using this device. In order to receive 80 minutes of uninterrupted cordless use, simply charge the product for roughly one hour. You can even shave you beard while the trimmer is charging. Some customers have stated that they were able to shave multiple times before recharging the device. This feature alone is sure to attract many more extremely satisfied customers. After you finish trimming your facial hair, simply rinse the blades and comb under running water. During the cleaning process, you can empty the hair chamber to brush away any loose hairs. This excellent device can be cleaned regularly for optimal performance and durability. Along with the beard trimmer’s unprecedented performance, the product’s washable attachments, zoom wheel, powerful lithium-ion battery, vacuum system, length settings, and accessories have all contributed to its sustained popularity. Many customers enjoy that there are numerous features for such a small product. They also appreciate the ease in changing the shaving heads as well as the minimal clean-up after use. Most of the reviewers stated that they would definitely recommend the product to a family member or friend. They would even purchase the product as a gift to a special loved-one. Rest assured that you will create the perfect beard style every time you use this product. After ordering this best beard trimmer, you will also receive a cleaning brush, beard comb, precision trimmer, and two additional detail combs. The size of the device is 2.4 x 5.9 x 10.4 inches and the weight is 5.6 ounces. The Braun Beard Trimmer BT5070 is a favorite among many men as the trimmer delivers exceptional results after each use. As the perfect tool for most facial hair needs, this practical product can easily provide the right style for your beard and stubble. From a light shave to an extensive trim, this product is a great appliance for every trimming job. Some of the product’s most notable components include quick trimming, adjustable combs, long battery life, easy clean-up, and more. If you would like styles such as a designer stubble or a trimmed beard, consider purchasing the Braun Beard Trimmer BT5070. This trimmer can also be a great gift for a family member, friend, coworker, or special loved one. Since the item is sold with two detachable beard combs such as the precision comb and the long beard comb, the trimmer is known for its unique flexibility. While the long beard comb can help you maintain a longer beard style, the precision comb delivers exact length and clean edges. With its innovative click and lock trimming feature, the adjustable combs are always secured safely in place. Manufactured to last an entire lifetime, the ultra-sharp blades of the product are designed to cut through any length of hair without any unpleasant pulling, snagging, or tugging. These ultra-sharp stainless steel blades will glide effortlessly across the pre-trimmed area. The product also offers 25 length settings, so you should have no problems cutting your mustache and beard to an attractive length. In addition, the item includes a slide-out detail trimmer to effectively style your beard lines. The slide-out detail trimmer can be used with any attachment. The product’s ergonomic design is also loved by many users. While the trimmer is small enough for travel, the medium-sized item can also comfortably fit into your hand. The item’s perfect shape can easily contour to the curves of your face. Despite its name, the product can be used for the head, goatee, mustache, stubble, and full beard without resulting in unpleasant irritation or split hairs. In order to ensure that you can always use the product, the Braun Beard Trimmer BT5070 features corded and cordless operation. The item is equipped with powerful Ni-MH batteries to provide roughly 50 minutes of uninterrupted cordless trimming. Along with its impressive battery life, the product will be fully charged in only one hour. Because the power button is strategically positioned, you will not experience any inadvertent stops while trimming or accidental start-ups while changing the attachments. After using the trimmer, simply run the product under water for easy cleaning. The appliance is 100 percent water-resistant. 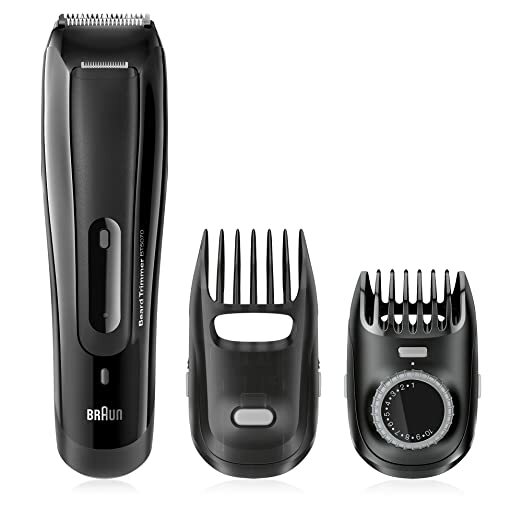 The Braun Beard Trimmer BT5070 is sold complete with a travel bag for easy storage at home or during travel. The combination of these practical components has resulted in many extremely satisfied customers around the world. Most users would recommend this product for those who are searching for an easy-to-use and convenient trimmer. As a result, you definitely will not regret purchasing the Beard Trimmer BT5070. Offered in black, the size of the product is 6.1 x 2.2 x 8.7 inches and the weight is 15.2 ounces. The primary purpose of the Philips Norelco Beard Trimmer Series 3500 is to provide you with an attractive beard and stubble with minimal manual effort. Equipped with an advanced lithium-ion battery that provides about 120 minutes of cordless use, the motor in this product is completely content with performing most of the work while you simply guide the product over the desired areas. This versatile device can accommodate beards of any length and hair type, but the product is especially useful if you have an extremely short or fine beard. Most importantly, this trimmer promotes natural and easy usage among many users. 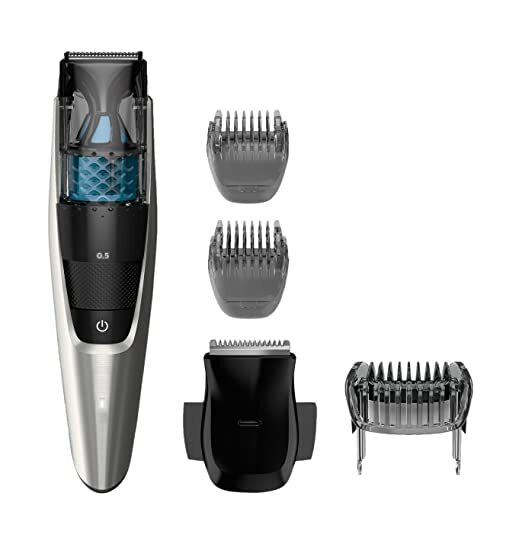 The Philips Norelco Beard Trimmer Series 3500 is most recognized for its easily adjustable built-in 20 precision length settings, which range from 0.5mm to 10mm. These multiple settings enable you to achieve an attractive cut for your mustache, beard, or sideburns. In order to encourage a hassle-free trim, the zoom wheel technology secures your desired setting; therefore, no separate attachments are needed. This exclusive locking feature provides a precise and customized shaving experience. The product’s rounded blade tips can promote a protective trim by preventing skin irritation. These self-sharpening steel blades have been shown to effectively cut facial hair as they always stay extra sharp for your convenience and comfort. Since the product is relatively small in size, the trimmer can be easily maneuvered around the face for a nice shave or trim. The product dimensions are 2.4 x 5 x 9.6 inches and the weight is about 12. 3 ounces. In addition, the trimmer’s ergonomic design can help you trim hard-to-reach areas. The product’s compact size will even allow you to trim facial hair while the trimmer is charging. Most customers appreciate that they do not have to wait for the item to finish charging before using the trimmer. If you would like to wait until the device is totally charged before shaving your face, the product will be completely charged in only one hour. Additional features of the unit include a quiet motor and a long battery life. Once you are finished shaving your facial hair, you can simply rinse part of the device under running water. Because the product is not waterproof, try not to run water over the entire trimmer, and focus only on cleaning the washable heads. The heads should be completely dry before they are placed on the trimmer. As a low maintenance device, the trimmer does not require any oil or special ingredients for cleaning. Known for its good basic functions and usability, the Philips Norelco Beard Trimmer Series 3500 is offered for a relatively low price. The product features a silver front and a black posterior. After ordering the unit, you will receive an electric trimmer, cleaning brush, beard comb, power cord, and even a convenient travel pouch. The product is also sold with a 45-day risk-free trial and a two-year warranty. According to the many customer reviews, this product will be a good value for your money. As one of the only all-in-one beard trimmers on the market, the Remington MB-200 Titanium Mustache and Beard Trimmer can properly trim, shape, and edge your beard. Featuring titanium coated blades with revolutionary trimming technology, the product can deliver a clean cut without any unnecessary tugging and pulling. The motor of the unit is extremely strong, so this trimmer would be great for those with coarse or think beards and mustaches. Although the Remington MB-200 Titanium is sold with a small price tag, the product is extremely big on performance. The uniqueness of the product lies in the adjustable comb, wide blade, and self-sharpening blades. The purpose of the adjustable comb is to eliminate the mess that is typically associated with multiple length combs whereas the wide blade is designed to provide fast trims with straight edges and lines. Made of durable titanium, the self-sharpening blades always ensure a sharp and precise cut with every use. These lube-for-life blades will never need oiling; therefore, the unit is practically maintenance-free. Because the product contains a non-slip handle, the trimmer is unlikely to slip from your hand as it can be easily gripped. The Remington MB-200 Mustache and Beard Trimmer measures 3.5 x 5.8 x 10 inches and weighs 1 pound. This cordless trimmer offers you nine settings so that you will always obtain the perfect trim after every use. By using the easy-to-use zoom wheel, you can adjust the blades to your desired length. The settings include 1.5mm, 2.5mm, 4.0mm, 5.5mm, 7.0mm, 9.0mm, 11.0mm, 14.0mm, and 18.0mm. Once you have chosen a setting, the trimmer will lock to ensure that the product will not jump to a lower setting. Most users report that it’s pretty easy to adjust the height. The unit contains one guide comb, so you will not need to ever change guide comb heads. One of the primary reasons most users purchase the Remington MB-200 Mustache and Beard Trimmer is because of its reasonable price and good value. Since the trimmer is an extremely durable product, many users have owned the shaver for as long as five years. The product’s innovative LED changing indictor also attracts customers to the trimmer. The unit’s good battery life greatly contributes to the overall impressive durability of the product. The Remington MB-200 Mustache and Beard Trimmer is currently sold as a color combination of black and silver. In today’s society, most people maintain extremely busy lifestyles; therefore, purchasing the best beard trimmer that is extremely easy to clean is a priority for many consumers. Since some of the best shavers require minimal maintenance, you should consider searching for devices that can be properly cleaned in only a few minutes. It’s also a good idea to pay close attention to whether the beard trimmer is completely washable. There are some trimmers that are not designed for total water immersion. These type of non-washable trimmers should be cleaned with a brush, which is usually included in the package. In addition, consider purchasing a trimmer with revolutionary vacuum suction technology. Devices that are equipped with this innovative feature can capture your hairs in a small chamber, thus significantly reducing the amount of clean-up after use. If you purchase a device with a vacuum system, your spouse or roommates will definitely thank you. One of the most important factors to consider when buying the best beard trimmer is the product’s usability. A poorly manufactured shaver may result in unnecessary snagging and pulling, which ultimately creates skin irritation and split hairs. Consider asking these questions when shopping for a new beard trimmer: Can the product shave hard-to-reach areas such as under the nose/neck or around the jaw? Are the features on the device functional? How easily can the different attachments be applied to the beard trimmer? Does the product have an ergonomic shape that is easy to hold? The answers to these questions will lead you to your perfect beard trimmer. You might also want to review the parts and accessories that are included in the beard trimmer purchase. Although beard trimmers are primarily used to reduce the length of your beard, some can effectively trim other parts of your body such as your back, chest, or legs. In most cases, the quality of the blades will determine the quality of your shave. A great beard trimmer will most likely have extra sharp blades that can easily cut stray hairs on the jaw and cheek line. A sharp blade will also help you achieve the exact shave that you desire. Some experts recommend selecting devices that have titanium, carbon, or ceramic-coated blades. The top devices will not even require you to oil the blades in order to work well. The lube-for-life and self-sharpening blades are a reflection of the shaver’s excellent durability, quality, and performance. Many of the best beard trimmers are equipped with a lithium-ion powered battery. These types of batteries have been shown to provide between 50 and 120 minutes of cordless use with a minimal amount of charge time. Some devices with this strong battery even offer a five-minute quick charge while others can take as long as 15 hours to completely charge the product. There’s no doubt that beard trimmers with lithium-ion batteries last much longer than other devices without a powerful battery. In order to ensure that the product caters to your lifestyle and unique needs, review the battery life and charge times of potential beard trimmers. There are also beard trimmers that feature a charge level indicator so that you will know whether the device is completely charged, almost dead, or somewhere in the middle. You might also want to consider whether a trimmer needs a cord to run or can operate on batteries. Battery-powered beard trimmers are typically more flexible and convenient than strictly corded devices. On the other hand, a corded beard trimmer is unlikely to die since the product doesn’t run on batteries. If you decide to purchase a cordless trimmer, make sure that the average battery life per a charge is long enough to groom your entire face. You wouldn’t want your trimmer to run low on battery in the middle of a shave. Depending on the length or coarseness of your hair, you might need to purchase a trimmer with a strong motor. A beard trimmer with a subpar motor is likely to tug at your beard, which will ultimately result in extreme irritation. The best beard trimmers are ones with a powerful motor that can glide effortlessly across your face. The device itself should be performing most of the work; therefore, minimal manual labor will be required from you. Because customers have different grooming needs, there is a beard trimmer for everyone. That’s why it’s important that you consider a product’s comb and length settings. While some devices are perfect for short beards and goatees, others are designed for long full beards. The best beard trimmers, however, will be able to accommodate many different types of hair lengths and textures. If you like to alternate between a long beard and a beard stubble, the length settings will be an important consideration for you. Before buying a new device, you will want to ensure that the trimmer can effectively trim to your desired length by offering a variety of combs and length settings. The number of speeds in a beard trimmer is also an important consideration. Depending on your preferred beard style and lifestyle, you may need to use a slow or fast speed. The most innovative and advanced beard trimmer offers more than the standard speed. For most people, one of the most important considerations is the price of the beard trimmer. In general, you can expect to pay more for a beard trimmer with impressive technologically advanced features, a durable battery, numerous length settings, multiple speeds, extremely sharp blades, washable attachments, and many accessories. There are also a few budget-friendly devices that produce a great shave, but you would need to know the qualities for which to search when shopping for inexpensive trimmers. Maybe even consider purchasing the highest quality trimmer that is within your budget. Many shaving products can be a great value if they include practical accessories such as a small carrying pouch. If you love to travel or maintain an active lifestyle, this convenient case or bag may be an easy way to store your beard trimmer and attachments. Storing your device in a small pouch or case is definitely a better alternative than packing the product unprotected in a suitcase or bookbag. Also included in the price is usually a comprehensive or limited warranty that covers a malfunctioning device or parts. Before purchasing a beard trimmer, you might want to check whether the product is sold with a warranty, the length of the coverage, and the pieces that the warranty will protect. If you perform this step beforehand, you might save yourself a lot of time and agony in the future should unexpected problems arise. The most important consideration to remember is to obtain a beard trimmer that offers you the best value for your money. A great beard or shave can drastically enhance a man’s face and even attract many beautiful romantic interests. In most cases, a neatly trimmed beard does not grow naturally; therefore, you will need to purchase a product that can create the perfect beard style for your face. Along with promoting a clean and even shave, a high-quality beard trimmer can greatly increase your overall confidence. The perfect shaver for your needs will easily create your desired style with minimal manual effort. Skin irritation and split hairs will be problems of the past when you decide to purchase a premium yet reasonably priced beard trimmer. You will save tons of money if you buy a long-lasting trimmer with a good battery life and attractive features. Most importantly, you will improve your overall facial appearance, and possibly gain a few admirers in the process.